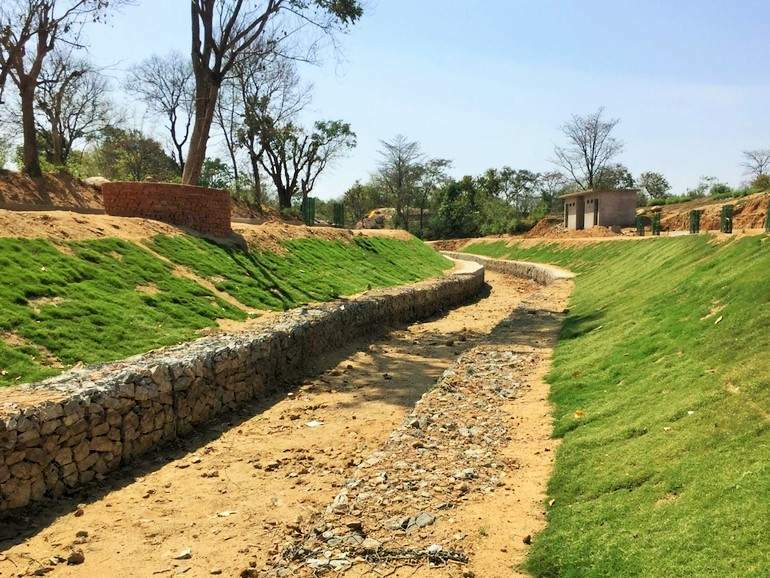 Our MacMat®, which has been used for erosion control, has also enabled quick growth of vegetation to help Jharkhand Urban Infrastructure Development Company Limited (JUIDCO) protect landscape and people after it constructed a 2.7 km long irrigation canal with the help of our gabion walls. Jharkhand Urban Infrastructure Development Company Limited (JUIDCO) has constructed a 2.7km irrigation canal with our Gabion walls. Above the wall there is a 3m high slope with a 1:2 inclination. During the rainy season, soil erosion and scouring of the slope can occur which is likely to cause damage to property, interruption of work, and present a possible danger to workers’ lives. With this in mind, the client wanted to protect the slope by adopting erosion control measures. The client wanted a solution that was easy to install and which would encourage the quick growth of vegetation. The soil used to prepare the slope was frictional with very low cohesion, which can be eroded easily by wind and rain water. This soil nature meant rain cuts can form easily without vegetation. To tackle surface erosion our MacMat® has been selected. MacMat® is specifically designed to provide erosion control for slopes of 1:1 or higher inclination. Our MacMat® is a reinforced geomat obtained by a polymer-made three-dimensional matrix. As a system, it holds the soil on slopes in position and provides the root reinforcement during the early stages of plant growth which is necessary for natural vegetation to resist the extreme effects of wind and water. When installed, MacMat® is filled up with top soil and provides excellent surficial protection. As the germination starts and vegetation becomes established, the roots become entwined within the structure of MacMat®. This provides anchorage to the vegetation to resist against high shear stress situation. The MacMat® is an effective erosion control solution for a wide range of applications like embankment protection and cuttings in highways and railways, irrigation channels, canal embankments and slopes, ponds and lakes banks, landfill embankments and covers, etc.